I am getting quite excited about Victoria magazine being published in November. At first I was a bit dubious about a new Victoria magazine, especially hearing that Hearst was not actually publishing it. But the few pictures I have seen, have given me cause to hope. So in celebration and anticipation I would like to host a Autumn Bliss week. I have several autumn crafts, recipes, ideas. I plan on having Autumn Bliss the week of 10th through the 16th of this month. If anyone feels like joining in, send me a link to your post and I will post it. It can be any idea, craft, poem, corner of your home, recipe, ect. Also feel free to use the image above. Congratulations on an award that you are most deserving of, Clarice. You have a wonderful gift of making others feel special. 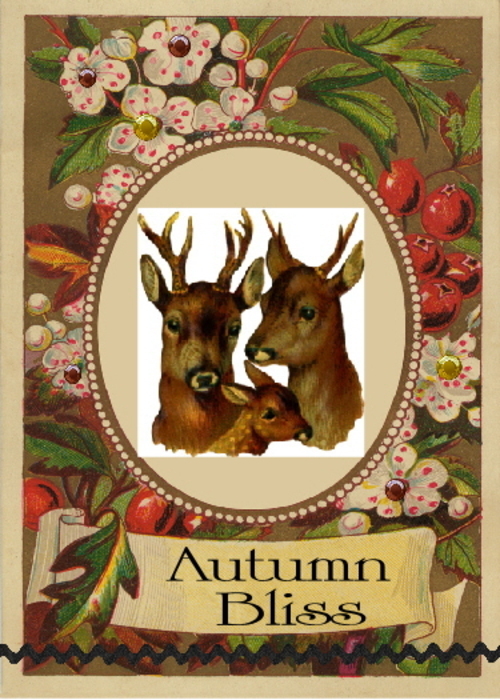 I am really looking forward to your Autumn Bliss posts! Add me to the list of those who are delighted that Victoria is returning... and I would love to participate in Autumn Bliss next week. This has been my first visit to your blog ~ but it is most certainly NOT my last. After all, Unforgettable is one of my all-time most favorite songs!! You've changed your blog to a Fall theme...love it! I am also decorating for Fall as it is definitely in the air here! I would love to participate in your autumn bliss. I am relatively new to the blogging world and am totally enjoying "lurking" and reading about so many talented people. I'll have something posted for Autumn Bliss next week! Autumn bliss! That sounds magical! I'll be anxiously looking for all your blissful surprises! Congratulations on the nice matters award, totally deserved as you have so many lovely things going on in your blog space and that lavender mouse recipe is sounding divine. Can’t wait to see what you come up with for autumn bliss, it is a wonderful theme to put everyone into seasonal creative mode. I also wanted to let you know I have tagged you in the 'name game' come by and see what its all about. Oooh...an Autumn bliss week sounds wonderful, Clarice!! I can't wait to see all the great ideas! Congratulations on the Nice Matters Award! Your Autumn Bliss week sounds like fun. I don't know yet if I'll be able to participate (I'm still painting my living room). I would love to participate in Autumn Bliss--please count me in on this celebratory effort. As you are, I'm looking forward to receiving the first Victoria Magazine. I have almost all of their old magazines, just missing a few here and there--they are so inspiring. Thank you so much for visiting my new blog; I am so glad you like my tutorial. I love the new look here at Storybook Woods. I really like the mushrooms....but the owls are so cute too! You must have the deer up for David (the Great Hunter). It is nearly deer season too, eh? Thanks for stopping by my blog Clarice... it felt good to get your welcome back... you are nice! And I hope to join you in celebrating Autumn... I love the change of seasons... the fall colors... so rich in warmth lure one to look forward to cuddling by the fire! Let's make an Autumn Wish. Autumn Bliss sounds great, can you give us a few more details about your idea? I am making reversible cloth tote bags, one side for Halloween and the other side is a complimentary fall color or print. Would that be right for your celebration? Your friend, the inexperienced blogger. You truly are one of the nicest people, I've had the pleasure to meet, Clarice. Congratulations on your award. It looks like you are having lots of fun creating a new autumn look for your site. I like it very much. Your Autumn Bliss week sounds like a wonderful idea. Sounds like fun! I would love to participate. Seems like everyone in blogdom is embracing the coming Autumn months! I can't wait. Love your new look it is truly Autumn Bliss! Autumn Bliss, sounds like a great idea.